Pine trees are beautiful, but the one time that they’re not is when they drip shiny, gold sap. Along with the undesired sap, problems may arise depending on the amount of sap and its color. Keep reading to find out all you need to know about pine trees and signs there may be something wrong with them. When do pine trees produce sap? 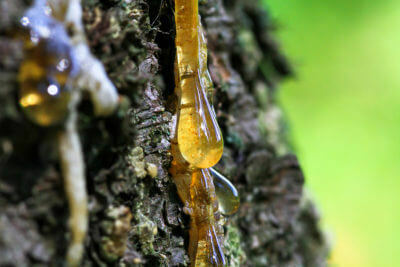 Sap is very important for pine trees. It allows nourishing ingredients to run throughout the tree. Sap can be produced year-round, but it happens most often when they begin to bud or when the season changes. The most sap will occur during the spring and early summer. What is considered to be a normal amount of sap? Sap that is not gold in color. Gold sap comes from healthy pines; any other color can mean that your tree has a disease or pest problem. Can I make pine trees stop producing sap? A pine tree that drips a little bit of gold-colored sap is normal, healthy and natural. If, however, your pines are producing a lot of sap and it is not gold in color, you should get your trees inspected for disease or pest issues. We offer inspections and provide treatments for trees, just contact us at (866) 313-2333.